If you have been following me for some time, you know I am a huge supporter of a good breakfast in the morning. I cannot even imagine stepping out of the house without having had something to eat, even if I have to go out very early. 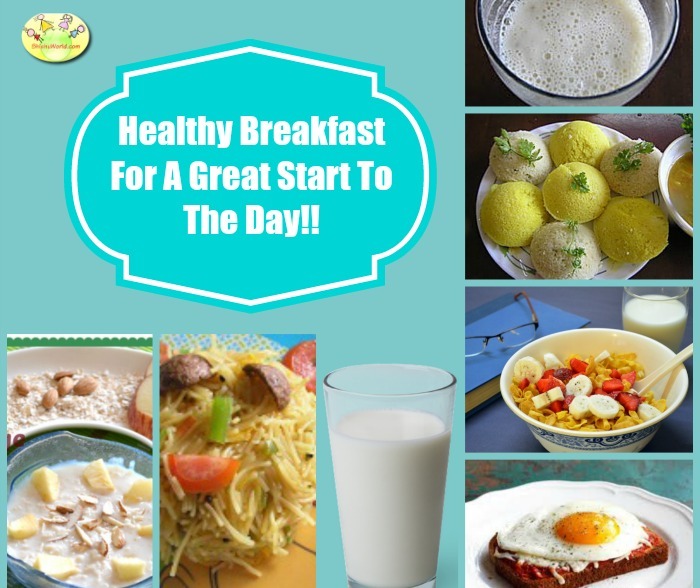 I believe it is even more important for children to have a good breakfast before leaving for school for #RightStart to the day and everything was fine till last year. She always has milk and some kind of breakfast before we left for school bus. But this year has been a little tricky. Her bus comes before 7:00 am. Which means she needs to have breakfast around 6:30 am and we are in a rush to finish everything fast. She often does not want to have her usual oatmeal and nuts or toast and eggs that she liked having earlier and now she wants only milk in the morning. I pack a breakfast/ snack for her that she has in school around 9 am, but I still like to see her having something that will sustain her till then. 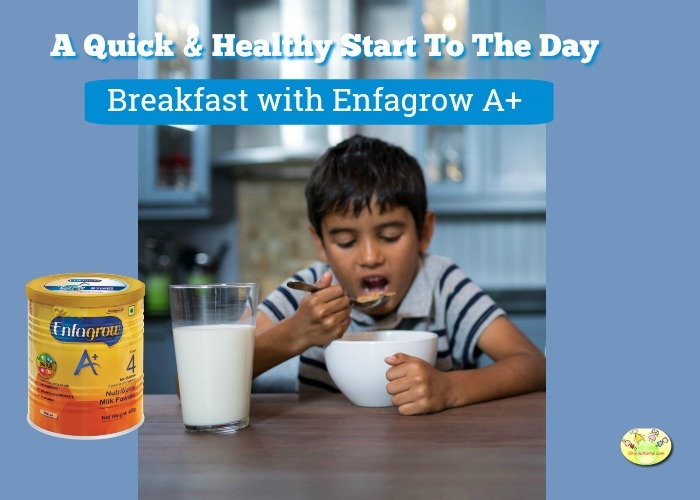 I have recently switched to Enfagrow A+ stage 4 nutritional milk powder, which is suitable for school going children between 2 years to 6 years of age. It is the number 1 childrens nutrition brand in the world and is now available in India too #EnfagrowIndia. I add it to her milk, even though it is a milk powder and can be constituted with warm water, so even if milk is not available on certain days, I can still make it and give it to her. As per the brand, Enfagrow A+ provides high levels of DHA as compared to leading children nutrition brands in India. The DHA in Enfagrow A+ is high quality, specifically approved for use in paediatric nutrition. Enfagrow A+ contains DHA Plus, which is a blend of key nutrients that help support brain growth and development. These nutrients support mental functions which include learning, memory, attention and concentration. Given the nutritive value, doctor recommended Enfagrow A+ for my daughter. 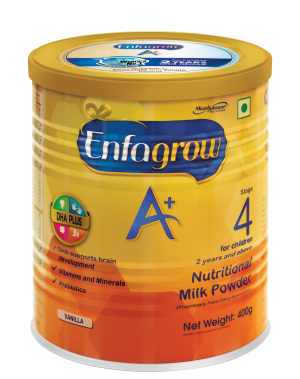 Enfagrow A+ also helps meet RDA levels for other brain-building micro nutrients like Iron, Zinc, Vitamin B6 and B12, Folate etc which have high levels of deficiency even amongst affluent children in India. Enfagrow A+ stage 4 is also filling and makes sure she is full and active before her school breaks for morning snack break. How to make Enfagrow A+? The suggested constitution in 3 scoops of powder in a cup of boiled water which has been cooled down to warm. That’s the way we make it. When I want to add it to her milk, I usually add 2 scoops to 1 cup milk for my daughter. What are our favourite breakfast options? Our favourite options for breakfast are dosa chutney, egg and toast and sometimes suji or vermicelli upma. A cup of Enfagrow A+ with fruits is another favourite when she does not want to have anything heavy or we are short of time. It is available in Vanilla and Chocolate flavours, chocolate being my daughter’s favourite. I even add a scoop to her oatmeal or cereal when we are having that. Breakfast is the most important meal and these are some wonderful options. Wow. Thanks for the tips. Breakfast is very important for kids. healthy breakfast is very important even if you are rushing through. ENfagrow helps to meet those nutrition that kids miss when they dont want to eat! Seems like a good option when the child is in a rush to head to school. Yes Rachna. Thanks for reading. Yes after the school starts a big shift in babies eating pattern happens. Will surely check out this product soon. The world no 1 thing has stuck in my mind for good. Do share how you liked it. A protein rich breakfast is excellent for growing kids.What is the type of protein in this ?